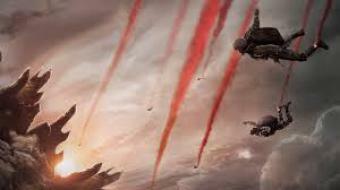 Gareth Edwards reboots Godzilla – the monster that’s all metaphor. 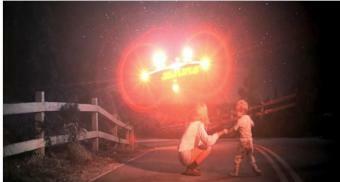 “We are not alone’’ was a famous tag line of Close Encounters of the Third Kind, which viewers might have taken as a warning before they saw the film, and as a reassuring thought afterwards. If those things were going to come, and the Steven Spielberg of the 1970s was pretty sure they were, then you should at least hope they would be a benign force. Close Encounters was one of two films released in the same year that shaped the early thinking of British director and effects genius Gareth Edwards. The other doesn’t exactly need to be spelled out (okay, then: Star Wars). Edwards would have been far too young to have seen either on release so both came to him as long-established VHS objects of pop culture importance, the ur-text of every lesser version that he would have caught in cinemas during the 1980s. By the time he made his own films, the stuff was in his DNA. In the bonus features on the blu-ray of Edwards’ first film, Monsters, there is footage from an audience Q and A at the Melbourne Film Festival in 2010. Someone asks about gas masks in the film. What are they for exactly, those gas masks? Edwards says that he didn’t realise until later that the gas masks came from Close Encounters, via however many years in his subconscious. For him, Spielberg is like garlic – his own analogy – as he’s imbibed so much over the years that it seeps out without him noticing. There are worse things to smell of, if your goal is to make sci-fi and monster films that come with a sense of genuine awe (awe more often than terror). The point about gas masks in Close Encounters is that Richard Dreyfuss and Melinda Dillon wear them into the military zone surrounding the UFO site at Devil’s Tower before figuring out that there is no contamination, that the military’s cover story is a con. The same thing in Edwards’ second film, Godzilla: Joe Brody (Bryan Cranston) and his son Ford (Aaron Taylor-Johnson) break into the quarantine zone in Japan and discover that the air is breathable and they don’t need the gas masks. Another military deception. It’s just one of a few parallel moments between Close Encounters and Godzilla. But back to Monsters, which was a revelation. Made for ‘‘way under US $500,000’’, it suggested that a low-budget take-over of the summer blockbuster was not just possible but necessary. It had only two actors, the real-life couple Scoot McNairy and Whitney Able. Edwards (who was credited as writer, director, DOP, production designer and creator of visual effects) improvised a story on the roads of Mexico, Guatemala, Costa Rica and Texas. It was a neo-realist monster movie largely populated by local non-actors and shot in found locations. The premise is that a space probe brought alien life to Earth, crash-landed in Mexico and created an infected zone in Central America. Now walls on the US border really are keeping the aliens out. Like Cloverfield, District 9, Children of Men and The Host before it, Monsters is a film whose real-world analogies and parallels are unavoidable, even if they are not always intended. 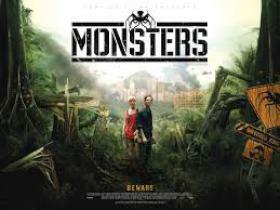 But what distinguishes Monsters from some (not all) of those other films is a genuine sentimentality about the humanity it encounters – the poor, the victims of air strikes, the collateral damage. As Edwards has said, if Cloverfield was a disaster movie about a first encounter, then Monsters is what happens when everyone has become used to life under occupation. Ads play in the background, reminding kids to wear gas masks. The squid monsters have their own folk art and superstitions. Night vision footage of alien attacks is visual wallpaper on 24 hour news channels. There is a good chance that other meanings came from the US actors as they improvised dialogue. ‘‘It’s different looking at America from the outside in,’’ one of them says, on the other side of the wall. McNairy even named his character, a photojournalist in a Salvador/Killing Fields mode, after a photojournalist he knew. Their last stop on the Mexican side is a Mayan pyramid, a remnant of a vanished civilisation. Once they cross into the US, for scenes shot in Galveston, Texas, the damage naturally resembles Louisiana after Katrina and the ruined town is eerily depopulated. The obvious point: here is the next vanished civilisation. Some classics are inevitably cited: Jurassic Park in a couple of the alien scenes, Apocalypse Now on the river. But Edwards’ lo-fi effects work has a sense of genuine awe and was done without a second of green screen. There are picturesque ruins in the jungle, there is a Herzogian ship in a tree, there are the evocative concrete skeletons of buildings. Unusually too, for a blockbuster – even if it is just a very cheap but effective approximation of one – the hero and the heroine have equal agency. That is at least part of the reason why the film’s final minutes at the gas station in Texas are so incredible, no matter how many times you see it (three times for me). Those images are beautiful and terrifying, with both the premise and the threat of that Spielberg line and all that it implies: we are not alone. The monsters get bigger in Godzilla. Everything gets bigger. The numbers get bigger: Monsters took just $237,000 on a limited release in the US and another US $4 million worldwide, according to Box Office Mojo, whereas Godzilla, made for US $160 million, had taken US $375 million worldwide after just 18 days. 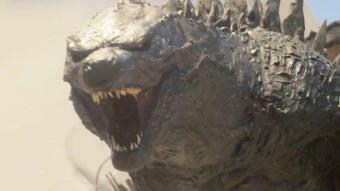 The story goes that a week before the release of Monsters into UK cinemas in 2010, Edwards was summoned to a meeting with Legendary Pictures in Los Angeles where the offer of Godzilla and a budget at least 320 times greater than the previous one was put on the table. With bigger money come different pressures. Edwards soon realised he couldn’t do everything himself, on the fly. He talks about the not atypical development delays in this Telegraph interview. The best moments of the new Godzilla have a kind of high seriousness. Camp is avoided, wisecracking is avoided. The moment that stands out, also cited by Edwards in interviews, is a beautiful sequence in which sky divers jump from a plane above San Francisco, where the giant lizard is battling it out with two giant insects, and they plunge into the smoke and darkness below. Edwards wanted to suggest ‘‘angels descending into hell’’ – and so these moments are scored to music by Ligeti which naturally reminds you of Kubrick and the sci-fi religiosity of 2001, and hint at some greater sorrow or deeper feeling behind the short-attention-span dynamics of current blockbuster cinema. That moment became the focus of the first trailer (see it here). Sure, everyone would have liked more of that, but the creature scenes have a brutal poetry and a sense of scale and gravity, even if they lack the fun that Guillermo Del Toro brought to Pacific Rim last year. Edwards’ Godzilla is an ancient or natural force, not created by the atomic age but accentuating its worst effects. In the 1950s, Godzilla was the most metaphorical of all movie monsters – as a Japanese expression of nuclear terror given form, he was almost nothing but metaphor, even if the first Japanese Godzilla film really started life as a local version of The Beast from 20,000 Fathoms. Context changed everything. By the time the appropriation went the other way in a post-Jurassic Park age, from Japan back to the US with Roland Emmerich’s disastrous Godzilla in 1998 (I wrote at the time: “two-plus hours of the oversize lizard running around Manhattan like a rat in a maze, or a bull in a china shop, or a man in a dragon suit … an endurance test of reptile suffering”), the metaphor seemed exhausted or redundant. In a time in which blockbusters prompt more think pieces than arthouse cinema ever did — Mother Jones: is the new Transformers pro-immigration? ; Salon: have we finally reached the twilight of the superhero? — Edwards pre-empts the critics and the analysts and provides the critique himself. We learn that as the apex predator, it is Godzilla’s responsibility to restore the natural order of things. That means that, much like Monsters, it takes human extinction as a real possibility, or as critic David Ehrlich put it, Godzilla is the first post-human blockbuster. Humans are not the target this time — we’re in the way, we’re collateral damage. This monster is a version of nature’s indifference. As in Monsters, there is sympathy for the beasts. Did anyone else feel they glimpsed the face of Bryan Cranston on the monster near the end of Godzilla, as he was left for dead? As in Spielberg, there are stand-offs and reconciliations between fathers and sons with Godzilla as the grumpy, ageing and tired patriarch of all monsters. Cranston drives the early part of the film as a nuclear engineer who loses his wife in an ‘‘accident’’ at the plant and becomes obsessed with its real cause. The model for this is naturally Richard Dreyfuss’ hill-building amateur UFOlogist in Close Encounters and it’s fair to say that Edwards’ film might have had more human spirit and a useful sense of humour if Cranston had stayed as protagonist rather than passing the cause on to his son Ford, played as a dull but decent army man by the bland Aaron Taylor-Johnson. The human element is more focused in Monsters, which grew from the obvious and relaxed chemistry of its actors and the long stretches of improvisation from which a dramatic plot could be shaped during editing. 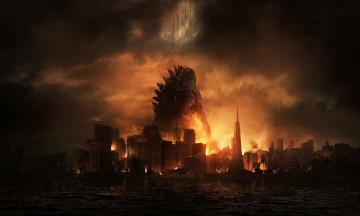 Films like Godzilla are built in entirely different, less risky ways. But other Close Encounters allusions seem more sure-footed: a submarine stuck in a tree in Hawaii reminds you of the surreal vision of a ship in the Gobi desert in Close Encounters, or the power cuts that signal an attack in Godzilla just as they signalled UFO flights over Indiana in the 1970s. At those and other moments, Edwards hits the mark. It was watch the skies then — it is watch the seas now.